That's what I have to keep reminding myself as I try to catch up on all that was left undone while I was down with that cold, and then out of town most of this past week. I've been putting off my City & Guilds work for so long that Linda might think I've disappeared altogether! No mind; I did a bit on Activity #6 (to do with quilt design and lay-out) this morning, so I should be able to post a finished lesson off before too long. All six pieced blocks for the red-work Centennial Quilt are quilted, and two of the last 3 embroidered blocks have been washed, marked and sandwiched -- sitting next to my machine, just waiting to be quilted. 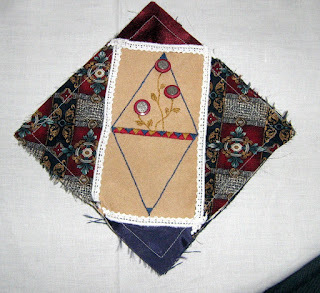 I am most behind, though, on the Crazy Quilt Journal Project/Take-a-Stitch-on-a-Tuesday challenge. 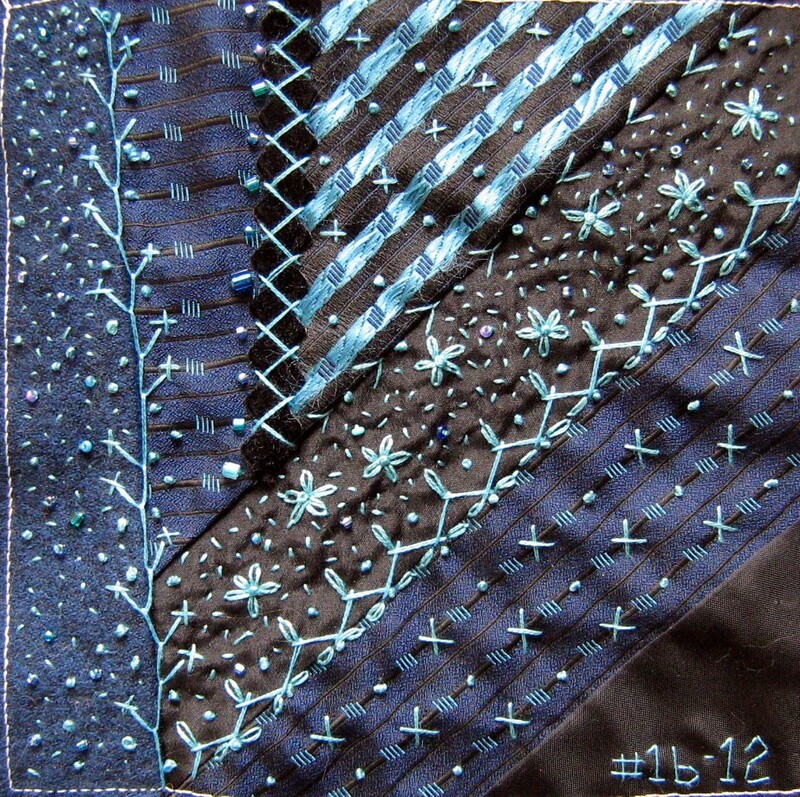 I've managed to finish the CQ block for TAST Week 16 -- French Knot was the featured stitch -- and posted it off to be displayed as my April contribution to the CQ Journal Project, so you might see it up there shortly. I had great fun with this one, flipping the men's tie fabric so that some is the 'right' side and some is the 'wrong' size (I love doing that!) and playing with knots, beads, seed stitch, and other stitches. I haven't formally titled these blocks but if I did, this one would be "Knots and Crosses". Now...I have another 3 buttons with which I could create a mirror image on the bottom triangle...or not...I remain undecided at this point. What do you think? While I ponder the final outcome of this block, I'm deconstructing two more ties and will be working to catch up TAST Weeks 17 and 18. "Wheatear" and "Crossed Buttonhole", respectively. 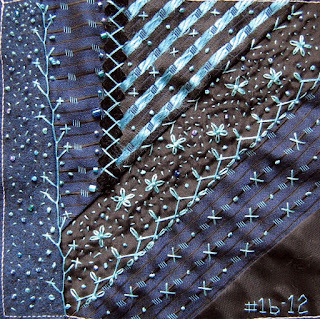 Oh -- and I haven't forgotten the bullion stitch tutorial that arlee posted, which I still have to check out. Time to get off the computer and get going! What a lot of projects, Margaret! Love the tie fabric and embroidery. After seeing your blocks on the CQJP site, and recognising immediately that you have used neckties for the base, I just had to come over and visit your blog. What an entertaining half hour I have just spent, reading through it, and leaving comments here and there! I have also used ties as the base for my CQ blocks, but my stitching isn't up to your standard, so my embellishments are very low key in comparison!